Whenever an opponent casts a non-creature spell, Cinder Lash deals 1 damage to that player. 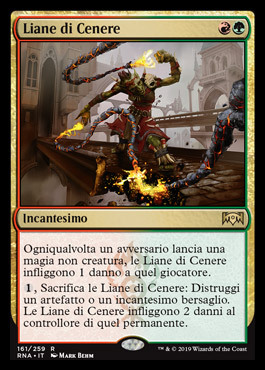 1, Sacrifice Cinder Lash: Destroy target artifact or enchantment. Cinder Lash deals 2 damage to that permanent's controller. A mini, non-legendary Kambal + artifact/enchantment removal against Vault, Oath or Shops. Also this is a proactive play against Shops since you can play it before spheres hit play and leave it there. Also immune to Flusterstorm may count to something. It can be Revoked so it's a removal that Shops has outs to. But between other removal and Dack, maybe Revoker is not a big threat. The point is that this can hit 3 archetypes, so it could be a premium SB slot or even MD one. Also important to note that the difference between 1 and 2 damage (Kambal) is huge, since with Kambal in play Tendrils is not a wincon anymore. I don't think that's what's key. Kambal gains you life. Tendrils still kills you with Cinder Lash in play, they just about 9 or 10 damage (assuming they don't have to take a line of casting their whole deck with paradoxical just to fine tendrils). This is far less like Kambal than it is Pyrostatic Pillar/ScabClan/Eidolon (but does hit any cmc non-creature spell). Maybe a MD singleton if your manabase can support it. Not sure its much more than that, but does feel targeted at Vintage. @vaughnbros I think so too. But it's a card that directly hits 3 main archetypes and has splash damage to a whole bunch of decks. That's rare. @ChubbyRain Mentioned on stream today that it might fit in some sort of RUG Delver shell. What about Christmas Beatings? ESG and SSG seem nucking futs with this card. The card seems decent, but the mana is rough. @juice-mane I disagree. Ancient Grudge sees a lot of play. This needs r/g at the same time. Grudge sees play because its R now and G later and its card efficient as well. Still, with as prominent as shops is, RUG could certainly make use of this enchantment. Certainly seems worthy of testing out. @khahan We don't play Taigas, so the "R now G later" must come from two different sources anyway. I guess the only currently played cards that do both are Mox Opal and Orchard. Dumb question. Is one damage per non creature spell enough to stop the decks this wants to stop? It feels like it would be but there are certainly some decks that can storm down to 1 life and win with this in play. @protoaddct it sure isn't. That's the whole Kambal vs this debate. But against PO for example, it makes them more aware of their plays AND you can also sacrifice this to destroy one of their artifacts if you think it's the best approach. I guess my point is making them think about their plays with damage is not relevant if your not planning to back it up with finishers and putting them to 0. This card seems to me like it would be far better in a deck with lightning bolts than one that plans on winning with key/vault or off a walker is all. Echoing the sentiment on Lavinia is WotC just done with symmetric hate effects? Not that it's likely with this card but the Blue Stew (tm) just co-opts the cards into their sideboards. Like Kambahl which would be a great core creature in a "new" deck it just becomes a boring hoser in a PO mirror. Echoing the sentiment on Lavinia is WotC just done with symmetric hate effects? Getting rid of Shroud for Hexproof was pretty much proof of that in my eyes. I wouldn't be surprised if WotC wants players to dump their entire hand and just play with permanents and their activated abilities. I guess they think stack interactions and complicated board states (that symmetrical effects contribute to) don't look good for potential casual players. @chubbyrain Obviously there was some exaggeration in my last post. However, I don't think you can in good faith argue that WotC hasn't been tending towards printing asymmetrical 'hate' cards. Mentioning just a few newer cards that incentivize the use of non-creature spells hardly undermines what people have been saying here at all, when a majority of the more powerful 'hate' cards printed recently have been asymmetrical. It's a little ironic that you mention selection bias in this context. If players don't consistently discuss what they like and dislike about cards, how is WotC going to get meaningful feedback? The Vintage player base is marginal, but at least here the people involved in making cards can see a relatively more thoughtful discussion about their decisions than in other places of discussion. Asymmetrical, aggressively costed graveyard hate cards have existed since the Dark. @vaughnbros Nobody is denying that. People, including myself, are saying that they don't like WotC's increased tendency to print such cards in the past few years. I won't belabor my point further. We're just repeating the same pattern of miscommunication at this point.